2014 was the biggest year yet for kids and parents experiencing life in the digital world. To help parents navigate their families across all the challenges, MamaBear published dozens of articles for parents looking for online safety tips, teenage social media trends, and advice about digital parenting. Among all the great content, following are the 5 most popular posts our readers loved the most. It may seem like an oxymoron, but in 2014, the big trend in social media apps was secrecy. Multiple apps that allowed users to create anonymous accounts became popular with tweens and teens — which created a problem for parents. The anonymity offered by apps like Whisper, Secret, Ask.fm and others put many youths at risk for being bullied, harassed, or approached by dangerous strangers. Parents used MamaBear’s List of Apps Parents Should Ban to get them in the know. The post gave parents a look at the popular apps kids are using to communicate with their friends (and possibly even strangers). Last year wasn’t all about apps for kids. Our MamaBear parents appreciated The Best Apps for Parents in 2014 throughout the year with helpful, time-saving and fun apps that parents could enjoy. Looking for even more apps for parents? Stay tuned. 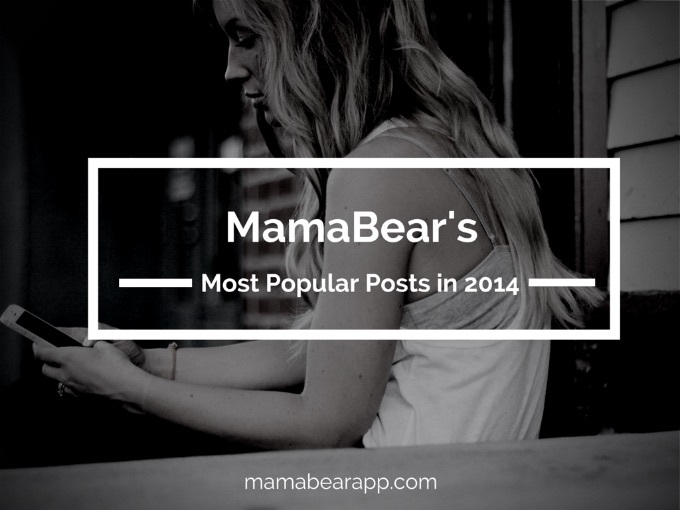 MamaBear will be releasing the 2015 list of the best apps for moms in our next blog post. Giving the responsibility of a cell phone to a child is a nerve-racking experience for most parents. So it’s no surprise that our post Tips For Giving Your Child Their First Smartphone For the Holidays was one of the year’s most popular. This article isn’t just a holiday read. It’s an excellent resource for parents who are about to give phones to their kids any time of the year. Learning that nearly 60% of teens have received an email or instant message from a stranger online made the Dangers of Talking to Strangers Online an important topic for 2014. Parents used the article to learn about a new list of chat apps and common chat slang that kids use to hide the meaning of their messages from their parents. These are just a few of the family safety and digital parenting resources MamaBear created this year. We have way more where that came from! Check out archived posts, look out for new ones, and download the MamaBear Family Safety App (available for both iPhones and Androids) so we can help make protecting and parenting your family easier in 2015.